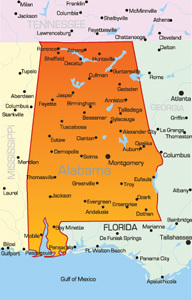 Alabama is the 23rd most populous state in the United States with a population of almost 5 million people. The capital city is Montgomery which has a population of 18,000. Highways that service the state include I-65, I-59, I-20, I-85, and I-10 all of which are perfect for billboards and other out-of-home advertising. The most notable college in Alabama is The University of Alabama located in Tuscaloosa. With a student body of over 30,000 and a very good football program, it is no surprise that the university is so well-known. AlabamaÕs beaches and other attractions bring an estimated 20 million visitors to the state every year. The largest employer within the state is Redstone Arsenal which is a army base.